Even the longest-standing Hastings United Football Club followers would surely be struggling to recall such a goal-laden week. The U’s banged in a remarkable 13 goals in four days, following up a 6-1 thrashing of Guernsey on Saturday with a 7-0 demolition of Herne Bay on Tuesday night. “After the FA Cup run, I think it was interesting to see how we would respond,” said United manager Darren Hare, speaking after the Herne Bay game. 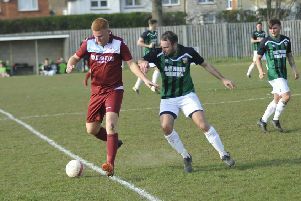 United scored twice in the first three-and-a-half minutes against Herne Bay, with the opening goal coming after just 36 seconds. “I think what really helped us was scoring early,” continued Hare, who felt the most pleasing aspect of Tuesday’s game was that United maintained the intensity throughout. “At times during the first half I thought our decision making wasn’t great and we gave the ball away in dangerous areas, but second half we were very professional, went about our business very well and should’ve probably had a few more goals. United have now scored 30 goals in 10 league games and they possess the best goal difference in Ryman Football League Division One South. “When you’ve got the likes of Matt Bodkin, Frannie Collin, Jack Harris and Barry Cogan in your team, you enjoy watching them play,” Hare went on. “They’re players that should be playing at a higher level and that’s our aim, but it’s not going to be easy; there’s some good teams in this division. Despite all the goals and crushing victories, United are still playing catch-up on the division’s leading clubs. They’re currently 13th in the table, albeit having played fewer matches than any other side. United are seven points adrift of Tooting & Mitcham United, who occupy the final play-off spot of fifth, with three games in hand. Next up for United is back-to-back fixtures on the artificial 3G surface at Whyteleafe FC. The U’s will face 14th-placed Whyteleafe tomorrow (Saturday) before taking on 10th-placed Walton Casuals at the same venue on Wednesday night. Frannie Collin was substituted as a precaution after half-an-hour against Herne Bay with a bit of a hamstring tweak, but Hare expects the in-form striker to be okay for tomorrow’s clash. Fellow forward Alex Akrofi will be available again after serving a one-match suspension against Herne Bay for five bookings. * HASTINGS United are running a coach to tomorrow’s game, leaving The Pilot Field at 11.30am. The cost is £20 for adults, with a £5 discount for supporters’ club members, and £8 for under-18s. To book a place, email Davidrussell881@hotmail.co.uk or call/text 07970 332270.